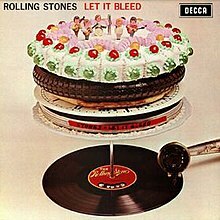 Let It Bleed stands as a critics’ favorite among the Stones’ catalog. For me, it will always be a huge disappointment. I grew up with lots of music in my house. In particular, my mom loved playing The Rolling Stones – up to 1967. After that year, she didn’t spin any of their platters. I grew up to Between the Buttons, 12×5, and December’s Children. I loved those albums. I believed that they could very well be in the running for “World’s Greatest Rock Band” based on those tasty tracks. But my mom refused to play the post-’67 Stones. Why, mom? “They’ve been dead from the neck up since 1968,” was her reply. One day, many years later, I questioned my mom’s judgment. After all, she didn’t like Led Zeppelin… maybe there was something to the Stones after 1967. I’d heard their stuff on the radio and liked some of it. So I tried out Let It Bleed. It had “Gimmee Shelter,” “Midnight Rambler,” and “You Can’t Always Get What You Want,” all songs I enjoyed. It promised to be a true pleasure, one of the greats. Whaddya know, my mother was right. Those three songs were the only ones I did like of the nine on offer. Most of the album sounded like a drug-fueled bar crawl. I didn’t hear the spark and brilliance I knew from their earlier work. I got the feeling the album was successful because the Stones were popular and that, therefore, anything they did had to also be successful. Success also meant importance, so the album became something on the order of Paris Hilton – famous for being famous. I like a third of the album and can’t stand the rest. I really don’t like it. 3 out of 10 and I’ll defend that. This entry was posted in Ze Rest of Ze Ztuffm on 01/24/2011 by deanwebb. Yes, The Road Goes Ever On is an actual album title. It’s a Mountain live album from 1971. It’s bluesy, warm, and amazing. Leslie West, the band leader and guitarist, has been described as “a guitar player’s guitar player.” Although obscure outside of the band’s big single, “Mississippi Queen,” West is a master guitarist that has garnered the recognition of the best in the business. This album has but four tracks. The first two, “Long Red” and “Waiting to Take You Away,” were from the band’s appearance at Woodstock in 1969. “Long Red” is a nice blues-based jam, while “Waiting to Take You Away” is a dreamy, impassioned exploration. Side one finishes off with “Crossroader,” another blues song that comes right out of Cream’s playbook. Ironically, the band’s producer and bassist, Felix Pappalardi, hated comparisons between Mountain and Cream and took pains to show how they were different, even though his vocal style was very much like Jack Bruce’s. All through side one, West’s guitar solos are a real treat. It’s fun stuff. Side two is one song: “Nantucket Sleighride.” Over seventeen minutes of jamming and sonic power. It takes the dreamscapes of “Waiting to Take You Away” and develops them at length. While I truly enjoy the studio version of the song, I always enjoy the live versions of the song. West’s ability to improvise with brilliance never disappoints. The keyboard player, Steve Knight, is a bit uninspired, but Corky Laing’s drumming and Pappalardi’s thunderous bass playing more than make up for Knight’s shortcomings. In the end, it’s West’s guitar and the visions that spring from it that dominate the album. If the album was just “Nantucket Sleighride,” I’d give it a 10. There are a few hitches and glitches on side one, but not enough to make the album score less than a 9 out of 10. It’s well worth finding. The live version of “Nantucket Sleighride” is a 99-cent download from Amazon, and that makes it a steal at that price. This entry was posted in Ze Rest of Ze Ztuffm on 01/23/2011 by deanwebb. NOTE TO THE WORLD: I have decided to secede from the ancient confines of traditional astrology, based upon Babylonian noodlings about the stars. It’s fatalistic, shoving people into their places based upon their time of birth, giving rise to notions of legitimacy based solely upon that factor and ruling out any possibility of a merit-based system. Such a system offends my modern sensibilities, and I won’t be party to it. Therefore, I have chosen a new sign for myself. I decided to break out of the Eurocentric mold and seek outside the Northern Hemisphere for my sign. I went with the Southern constellation “Chamaeleon” because the name is easy to figure out. It’s a chameleon. People born under the sign of Chamaeleon are like me, because I said so. If you’re not like me, you’re some other kind of constellation, so feel free to shop around and make up your own. 1. I want to choose my own destiny. 2. When I check my supposed traditional horoscope, every site has a different, often contradictory reading. Therefore, I conclude that making up my own horoscope, based on what I know about myself, will be way more accurate than anything some other astrologer could pull out of his head. 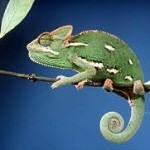 And I get to be a chameleon! How cool is that? Today’s Horoscope for Chamaeleon: Today is a good day for spending time with family. Consider taking your daughter to an Adventure Princess campout at Great Wolf Lodge. Showering will be important today: be sure to use soap. Consider pizza for supper at a familiar restaurant in Grapevine. Grade papers if you have time, but don’t worry if you let work slide a little to enjoy yourself. This entry was posted in Complete Fiction on 01/22/2011 by deanwebb. Rule number one: In my van, it’s Rush. All Rush, all the time. No exceptions. 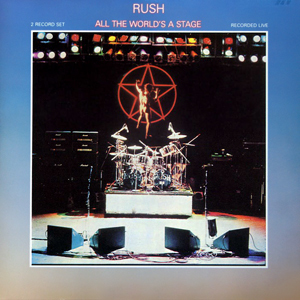 I’m listening to Rush in my van currently, and it’s All the World’s a Stage, their monumental 1976 live album that puts the period at the end of the sentence of “Early Rush.” After this album, Rush got really really progressive. Before, Rush rocked hard, in spite of their progressive tendencies. This is a great live album, too. Three guys, jamming away and making a lot of noise. It’s epic sci-fi and fantasy rock with awesome solos. Ironically, two of my most favorite tracks are quieter numbers, “Lakeside Park” and “In the End.” “In the End” is really a perfect song, and I can’t tire of it. 9 out of 10 because it’s the best Rush album in my collection. This entry was posted in Ze Rest of Ze Ztuffm on 01/22/2011 by deanwebb. I’m taking a break from album reviews tonight to remember my friend Greg Hewlett, who passed away recently. In high school, I was more metal and he was more pop, but we were really good friends. He was diagnosed with cancer almost 30 years ago and fought it ever since. But he didn’t just fight it… he moved beyond it. He earned 25 patents for his inventions after earning a graduate degree at MIT. More than that, though, he fulfilled our voting him “most likely to succeed” promises by always finding the silver lining to his problems. When his leg was amputated, he talked about being able to go skiing on one leg. He was always smiling and we didn’t really know his problems. He was aggressive about finding that silver lining. He inspired me even back in junior high. I’m glad to have known him and I know I’m going to meet him again. Greg, you showed me that there is always a way to find a smile if we just see things clearly. This entry was posted in Reason to Live on 01/20/2011 by deanwebb. The high pitches on the female vocals may take some getting used to for those new to the genre, but it’s a taste well worth acquiring. This is the best foot forward for Bollywood music, and I give the entire disc a 9 out of 10. “Dola Re Dola”, though, is superlative and the dance that goes with it is monumental. This entry was posted in Ze Rest of Ze Ztuffm on 01/19/2011 by deanwebb. I love reviewing this album any chance I can get. It’s one of my perfect 10’s and if you’re a fan of hard rock or metal, you must get this disc. It’s got Dio, Blackmore, and Cozy Powell at their prime with excellent turns from keyboardist Tony Carey and bassist Jimmy Bain. The band are tight, the music solid, and the virtuosity impeccable. It only has six songs and is barely over half an hour, but this album contains the essence of what would become the stuff of British heavy metal for the next 10-15 years. It’s strong in the fantasy area, and I loved this album when I was rolling up a D&D character. Interestingly, I think I’ve said enough already. If “Dio at his prime” isn’t enough to motivate you, then you really aren’t going to be into this album. If that is enough to motivate you, then I need not say more. You will get this album and not be disappointed. Like I said, 10 out of 10 for sheer awesomeness. This is an essential hard rock album. 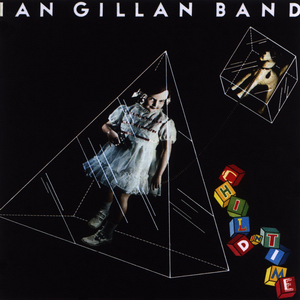 Monday, another day for disappointment in recordings… This week’s dirge deals with Ian Gillan Band’s Child in Time. The fact that I am NOT listening to any of its tracks as I write this is indicative of how poorly I think of it. Ian Gillan, of course, is one of my favorite vocalists. I can forgive lots of things he’s done. But I just can’t listen to this album. I remember when I first got it. I thought it would be awesome, eardrum-busting rock and roll. What I got was poorly digested jazz-fusion. Stunned after my first listening, I tried it again. Same results. I left in on my shelf for a few years and tried it again once I had grown and my tastes in music had matured. Same results. I think I finally sold it back to a used record store and left it behind me forever. Deep Purple’s version of the song “Child in Time” is a rock classic. IGB’s version is a jazz-fusion miscarriage. I remember how much Gillan’s vocals sounded like yowling cats on this record and that I really detested the lyrics on half the songs and didn’t care for the other half. I was so relieved when I discovered he went back to rock for his other solo work. This album gets a 1 out of 10. It’s gone out of my life and I don’t want it back. I didn’t even bother with going to Amazon to listen to snippets of the songs to refresh my memory of it. I just looked at the wiki article on it, recognized the song titles, and the revulsion was as fresh as it was over 25 years ago. This entry was posted in Ze Rest of Ze Ztuffm on 01/17/2011 by deanwebb. Missed yesterday, so I’ll do two today and one has to be a record I hate on. I’ll get the hate out of the way first. John Cage. I do not like John Cage’s compositions. I do not like compositions inspired by relationships with John Cage. Other people are free to like his stuff, but if there’s a piece of experimental music that I totally abhor, chances are that John Cage was the composer or had influence on the composer. 1 out of 10 because his stuff makes my skin crawl. Now for the stuff I like. Scheherazade by Rimsky-Korsakov. It’s full of life, color, passion – and rhythm. It’s not long-hair music that makes you pass out from boredom. It’s great fun and loaded with imagination. It’s also free: Peabody Institute has lots of their performances available for private use, so if you scroll down to the 2003-2004 season, you can get all four movements there. Enjoy! This entry was posted in Ze Rest of Ze Ztuffm on 01/16/2011 by deanwebb. Richard Fisher, Dallas Fed President, recently gave a speech. In it, he discussed the limits of monetary policy. (Hence the title.) If you’re in my class, you really should read that speech and discuss it here. If you’re not in my class, it’s not required, but you owe it to yourself, all the same. This entry was posted in Economics on 01/15/2011 by deanwebb.